Coleraine defender Gareth McConaghie has won the BetMcLean Player of the Month award for January. 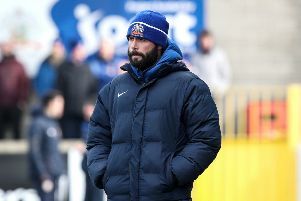 The powerful centre-back helped the Bannsiders to complete the month unbeaten, despite difficult games against Crusaders, Glentoran and Linfield. He also found the net in Coleraine's 7-0 Irish Cup win over Lisburn Distillery. McConaghie said, "I'm delighted to win this award, it was certainly not something I was expecting. "January was a good month for us because we had a number of tough games but we managed to come through it unbeaten. "We're still in the Irish Cup and challenging in the league, so it's still all to play for. "It's fantastic for Coleraine to be competing for the major trophies." Paul McLean of sponsor BetMcLean said, "Coleraine have been the story of the season so far and Gareth has been a big part of that success. This a thoroughly well-deserved award." NIFWA Chairman Keith Bailie said, "Gareth is now one of the most imposing defenders in the Irish League. While some of Coleraine's better-known players take the plaudits, McConaghie goes about his business with minimal fuss." Billy Joe Burns of Crusaders was runner-up, while Ards left-back Michael Ruddy was third.